Beautiful, fits perfectlt and very warm. Madison Park's Adella 7 Piece Comforter Set introduces a beautiful splash of color and style to your space. 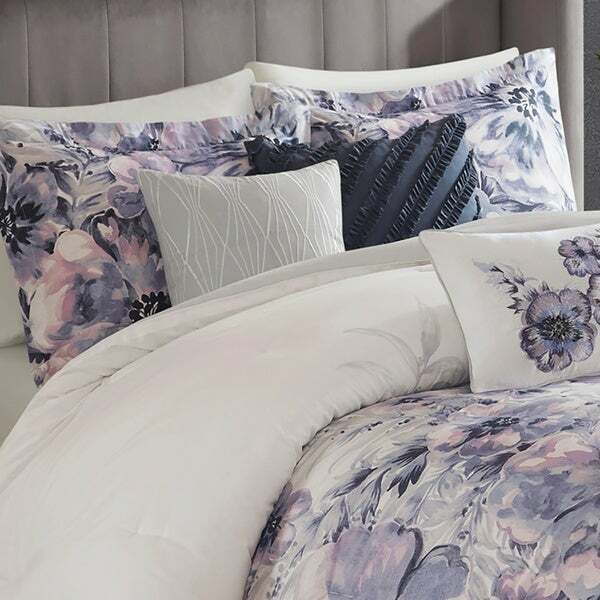 A floral pattern in a purple watercolor print is gorgeously displayed on the 100-percent cotton percale comforter and shams, for a stunningly casual allure. The solid grey reverse and bed skirt complement the top of the bed to create a chic coordinated look. Three decorative pillows with embroidered details and fabric manipulation add a charming accent to complete the bedding set. Overfilled to provide exceptional warmth and comfort, this comforter set is sure to brighten up and refresh your bedroom decor. Comforter is very fluffy and the colors are really pretty. This is super comfortable and warm. A little hot for summer time but all in all I'm really happy with the purchase. 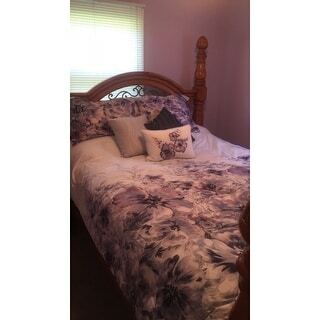 I LOVE my new comforter set!! It is way nicer than I expected. Some reviews stated the blanket was stiff and not comfortable, It is just the opposite, its fluffy and so cozy. I also wondered if it would fit my California king bed because all the other sets i have bought from other sites , the comforter was never long enough. This one is the perfect size. 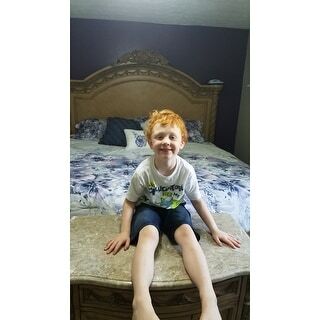 My grandson just had to be in one of the pics lol he says he loves my bed too ! I was disappointed in this but kept it because it was easier than paying to ship it back. The material is thin cotton and appears that it will not last very long. The batting in the comforter is clumpy and the throw pillows are cheaply made. I absolutely love this color combination. It goes perfectly with my bedset. I also love how many pillows come with it, makes for a complete set because I love pillows. Love this comforter set! It’s beautiful goes perfect in my bedroom. The weight of it is not too heavy but warm. The 3 pillows that came with it look fantastic. This comforter set is the best one I've bought so far! It is makes me not want to get out of bed. The fact that it fits my California king size bed better than others I've bought is a definite plus. This one gets an A+ !! I absolutely love this set. The material is fabulous and soft. Its also just the right consistancy for warmth. Making my bed has never been easier. It really pops in my warm purple and white paint. I would recommend this set highly. We sure are enjoying it! I was nervous about purchasing this set but I can tell you that it is EVERYTHING I hoped it would be! The colors are exactly as shown. The dark color is not black, but a deep navy blue. Great quality and I love the material. It’s heavy and not flimsy like other comforters. You NEED it. Beautiful pattern and very comfortable. I Love it!! It's soft and bulky! Colors are great! Bedspread is exactly as pictured. Is gorgeous on a large bed. Just love it, vibrant colors. Would recommend. I loved this set as soon as I saw it, so I buy it get it loved it. Put it in the washer for first time and it ripped at one of the seams and shrunk considerably. I don't know if I can return it. I'm so upset that it ripped. 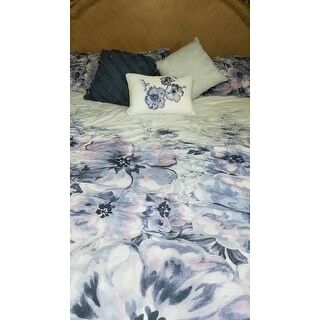 I bought this comforter set for my bedroom and i love it.It looks really nice. "Is the little pillow and the inside of the flowers navy blue or black?" "Can I purchase curtains to match this comforter "
Matching curtains are not available. It's absolutely beautiful have not seen this on any other site or store for that matter.